It's the story of two young best friends, both aspiring to become successful actors and writers. It is the story of famous best friends Matt Damon and Ben Affleck, as well as the story of Dartmouth alums Mindy Kaling '01 and Brenda Withers '00. Almost three years ago, Kaling and Withers started performing their acclaimed play, "Matt & Ben." Now, after off-Broadway success, a run in Los Angeles and a national tour including stops in Georgia, Toronto, California, and Connecticut, the Dartmouth alums are bringing their show to their alma mater. The 65-minute production is a spoof on the creation of the Damon/Affleck-penned mega-hit "Good Will Hunting," which earned a pair of Oscars for Best Orginal Screenplay for the stars. But in this version of the story, the career-making film script literally drops from the ceiling as the famous duo attempt to adapt J.D. Salinger's "Catcher in the Rye" into a screenplay. In this satirical play about -- and by -- aspiring artists, the shorter and broader of the two, Kaling, plays the taller character of Ben Affleck and slimmer, taller Withers plays the stockier Matt Damon. Bruce Weber of The New York Times attributed the play's success to the playwrights' "deadpan sense of the absurd and the vicious." The Dartmouth graduates began working together during Withers' senior year when, as members of the Rockapellas, Kaling and Withers were relegated to the responsibility of writing the skits. 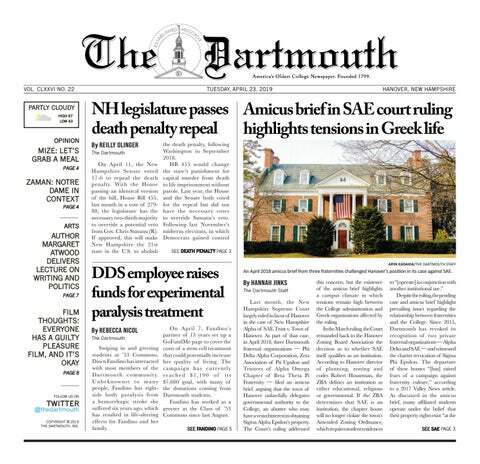 "We had a similar sense of humor, and a similar dread of doing those skits," Withers told the Dartmouth. "It was how we worked together, our friendship led us into it." At Dartmouth, Kaling was a member of the Dog Day Players, eventually serving as their president. Withers spent her time acting, which Kaling also took part in. "We're very excited to bring the play to Dartmouth," Kaling said. "We're so excited but a little bit nervous because we haven't said the lines for Uh-oh, nevermind -- Brenda's in the background being like, 'Don't say that!'" The play was first performed in this winter of 2002 for family, friends and a few Dartmouth alums, one of whom quickly became the girls' producer. After performing on the Fringe Theater circuit, Withers and Kaling took the play to a theater festival in March 2003. During the following summer, "Matt & Ben" found its niche at P.S. 122 in New York where it had an acclaimed10-month run. After the play's New York success, Kaling and Withers performed the play in Los Angeles while new actresses filled their shoes in the Manhattan production. After touring at other colleges, Kaling and Withers decided it would only be right to come to Dartmouth. "We did it at Yale in the spring because we thought it would be fun, and that was really a good time, so we thought doing it at Dartmouth would be a really great time as well," Withers said. The aspiring artists aren't stopping with the success of "Matt & Ben." The two are currently writing a pilot for the WB network in Los Angeles, flying back and forth between coasts. Kaling is also working for NBC on developing an American adaptation of the hit British comedy series, "The Office," that will be airing soon. "Matt & Ben" will be performed at The Moore Theater at 8 p.m. this Friday and Saturday.